Overview of Elanthian Magic is an Official GemStone IV Document, and it is protected from editing. Submitted to the Library Aies for use by Scholar Initiates, 5104. Basic knowledge and exposure to magic is central to all but the most backwards civilizations. Children grow up with stories of powerful spellcasters and often have the opportunity to watch them defend their town from the creatures of the wilds. However, few are the citizens who truly understand the forces at work in these effects. As a Scholar, one must understand the role that magic plays in our lives. For the purposes of this document, the word 'mage' will be used as a general term for one who casts magic, without any implication of that magic being elemental in nature. Magic, on its own, is nothing. Magic cannot create, and it does not destroy, despite appearances to the contrary. At its core, magic is the art of taking what is already there and bending and twisting it until it serves the function one would like. The Wizard does not create a flame any more than the act of striking a match does, it simply coalesces and frees the ambient flame in the area. Thus, the basis of magic is taking a desired pattern and coercing the local forces into it. In much the same way as technology can be roughly segregated into the mundane and the magical, so can magic be segregated into rote magic and flow magic. The basic difference in the two is that the creativity and skill required to harness flow magic is far beyond that required for rote magic, to the point where all manner of creatures from ogres to moulis have been witnessed performing rote magic incantations. Rote magic is magic that has been codified and formalized to the point where its use comes far more naturally than flow magic. It is believed that the ease of use of rote magic is due, in fact, to its common use. Much like a path through a field, the difficulty of rote magic seems to be eased by consistent use, as if the world's forces become accustomed to taking particular patterns. This effect, combined with the influx of those trained in the magical arts in modern times, may account for the increasing trend of the monster races utilizing these spells for their own purposes. 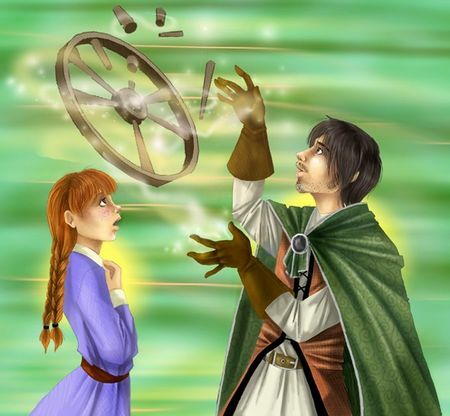 It is important to note that, aside from the original spells given to us by the Arkati, all current rote magic began its life as flow magic, and it is only through the dedicated pursuits of magical researchers that we have our modern wealth of rote spells. The known spells are organized into a series of spell circles, to assist with the planning of courses. As a general rule, the contents of a spell circle are decided upon by consensus of a council of mages skilled in that circle, and those contents are reviewed periodically in order to keep the circle consistent with the needs of its users. They are organized into several ranks, and students of the circle are encouraged to learn the ranks in order. In many cases this ordering is enforced by various means. It was once said, "If you would know the changes of power 50 years ago, look to the changes in spell circles today." An excellent example of this is the year 5103 modifications of the Major Elemental spell circle which included, among other things, a replacement of the millennia-old Blur spell with the new spell Thurfel's Ward, a spell created by a halfling Wizard. The two spells, despite using very different mechanics, provide a similar result: increased protection against physical attacks. The explanation for this change, seen through an unclouded eye, can be linked to the rise in influence of the Paradis halflings and the influx of talented Wizards from their ranks. The council paradigm does not apply in all cases, of course. The control of several circles is vested in a single individual. As well, there are some unique systems used. Two common circles serve to exemplify this fact particularly well. The first is the Sorcerer Base circle of magic. There are actually two versions of the Sorcerer Base circle of magic, one used by the Faendryl, and a second that is released to Sorcerers all over the continent. While in theory, the general council which guides the Sorcerer Base circle controls content in the universal version, and the Faendryl control their internal circle, it is generally known that the Faendryl have a hand in all decisions related to Sorcery, whether through respect or intimidation. As a result, the two circles are almost always synchronized with each other, with the exception of those spells which the Faendryl keep to themselves. The second is the Cleric Base circle of magic. The Clerics have a council which nominally controls the layout of the spell circle, but through use of the Prayer of Communion, their decisions are always heavily influenced by the Arkati themselves. Though their meetings are not open to the public, the information available suggests that the presence of the Arkati serves to temper the religious arguments that are inevitable when opposing fanatics convene. Some sources even report that, often, debates are held and decisions made by the Arkati while their followers bicker. In essence, flow magic is rote magic that has not yet been codified. Do not be led to believe that because someone is practicing flow magic, the basic operation of magic changes. Flow magic is less restricted and contained in its effects, but it is still magic and is governed by the same rules. Almost all early mages were flow mages to an extent. While the spells delivered from the Arkati were useful, they did not provide us with a full range of spells to fit all our needs, so we were required to experiment to fill the gaps. As well, at that time, flow magic was easier. The forces of the world in those days were more fluid and accepted manipulation more readily. Thus, the mages of those days were generally much more versatile, if not more powerful, than those of today. In the modern era, the development of flow magic is a long and arduous process undertaken by few. Researchers will sometimes spend hundreds of years developing a single spell, forming it until it is just right. Much of the difficulty is a result of the pervasiveness of rote magic. The existence of many patterns that are common hinders the development of new ones, as the forces will tend to fall into their comfortable forms rather than go where the mage would like. When developing flow magic, there is also the ever-present threat of a backlash, where the forces one is attempting to manipulate break free of their natural forms. While sometimes these backlashes are harmless, more often than not they are a serious threat to the mage. While there are techniques that reduce the risk, it is not a task one undertakes lightly. The progression from pure flow magic to a codified rote spell is a long one. A researcher first has to develop an effect that he finds useful, and coerce the forces into taking that pattern and holding it again and again until their resistance to doing so eases. At that point, the researcher then proceeds in the drawn out process of refining the spell, which involves attempts to alter the pattern slightly to achieve better results, reduce the mana expenditure required to achieve it, and ease the difficulty. In general, these steps are the much lengthier part of the process of developing a spell. Such steps, however, do not bind talented flow mages if they do not feel their spells require codification. True flow mages decide on a spell effect they wish, and impose that effect on the forces nearby. While their efforts do not result in the difficulty of performing the effect decreasing, rendering them useless to the magic-using world as a whole, the range of options available to them is staggering. As in rote magic, flow magic of a religious nature takes a slightly different course. Being very talented flow mages themselves, the Arkati are able to direct the course of development for Clerical magic, apparently having an agreed-upon level of power they wish their followers to control. A "flow mage" who studies Clerical spells, therefore, is more a conduit through which his controller can perform magic. The most well-known and visible users of magic are of course those engaged in battle, as can be seen by spell circle names such as Major Spiritual and Minor Spiritual, ignoring the fact that there are at least thirty circles of magic engaged in the manipulation of spiritual forces. Due to both the many opportunities for research in this area and the importance and glamour of the field, much of the most advanced magical research is done in this area. It is assumed that the student is familiar with the workings of this area of magic, however, so further detail shall be withheld. To the layman, this is generally where the presence of magic ends. It is a subject for those engaged in battle, and one that he need not concern himself with. He does not realize that the spells of the Agriculture Base circle assist in bringing him his food, that the Civilization Base circle of magic helps light his streets at night, or that the Construction Base circle of magic has been used to fortify his house. The use of magic does dwindle once one leaves the Nations, but even in backwater towns the privileged are likely to have some manner of magical assistance in their daily lives, though generally the common folk are not provided such benefits. While there are countless circles of magic, enough that efforts to catalog their contents are often out of date before publication, the details of each are unimportant to our discussion. Rather, it is more important to learn the general ideas of magic and the areas to which it is applicable. It should be noted that, in general, the industries of the Nations are able to proceed without the benefit of magic and fare acceptably. However, when available, the magical support often results in a much better product. Recently, especially with the increase in trade with the Dwarves, humans, and others, the demand for such products has increased, causing more mages to eschew traditional combat training in favor of such commercial roles, which carry lower potential profits but higher reliability and markedly better prospects for survival. Though historically construction has involved the application of onerous amounts of mundane strength and endurance, except in the case of the nobility or royalty, the increase in the availability of magical training over the last thousand years has resulted in additional mages concentrating on the field of construction. Thus, this is a key application of magic that will likely continue to grow in coming centuries, and the effects of this are not entirely known. The use of magic in construction concentrates itself in two places. First, much of construction involves the transportation and erection of heavy pieces of material. Though rare, magical support in this area tends to provide either a temporary lightening of such pieces to allow them to be transported more easily by hand, or actual magical support in transportation. The latter can be riskier, as an unskilled mage may end up doing damage to the construction materials through mishandling or magical mishap, but generally provides a larger reduction in required manpower, and thus cost savings. In the Dwarven realms, a large increase in magical tunneling efforts has sprung up recently as well, due to several new tunneling spells which are much more reliable than previous ones, causing far fewer cave-ins and much better longevity. In some circles, such efforts are met with a healthy distrust, however. Second, after construction is complete, magical reinforcement of the structure can be applied. Traditionally, this type of magic took several years and was reserved for the most vital structures, such as the city walls and palaces of the Nations. In the late 4900s, a new spell was developed which produces a poor facsimile of the traditional reinforcement, but with a fraction of the time investment. This has proved very popular with wealthy merchants and others who cannot obtain a true reinforcing from royal mages, but wish their houses and storefronts additional protection from inclement weather or hostile forces. While such services are still out of reach for the vast majority of citizens and not offered outside the Nations and other large cities, the rate of increase is such that home reinforcements may be affordable to common elves within the next several centuries. The production of common steel weapons is, in general, left to those without the funds or wish for magical help. However, simply forging weapons and armor from magical metals requires the smith to obtain enchanted tempering oil, and many materials need additional magical support. Glaes, for instance, must be forged with fires hotter than are possible without magical aid. Mithglin, as well, requires magical aid to merge its constituent metals into the bars from which it is forged. Once a weapon is forged, the blade can be used as is perfectly acceptably. However, there is a large market for magical enhancements that many types of artificers are employed to provide. Such weapons include Feras' blades that attack their foe with lightning but destroy themselves in the process, more standard blades that emit intermittent blasts of elemental energy, weapons enchanted to provide guidance to their user, and so forth. The available enhancements to weaponry are quite varied, due in large part to the adventuring market that is almost ravenous in its desire to obtain them. The military is one of the realms where magic is most heavily integrated. The use of battle magic is of course one of the cornerstones of combat, but it is assumed that these functions are well known. There are many secondary functions that mages provide, however. First and foremost, the military could not survive were it not for supplies and communications. Here, magical support is most vital due to the long distances involved when military units are in the field. Due to their warring tendencies, the Turamzzyrian Empire has a quite sophisticated system to support their campaigns. Many units are equipped with logistical officers, and larger units have logistical mages who perform such actions as increasing the carrying capacity of pack animals and soldiers, providing long-distance communications, and increasing the preservation of supplies. There is even a rumor that the humans have a circle of magic dedicated to logistical support, though it remains unsubstantiated. As mentioned previously, reinforcement is also a common magical task. The fortresses of the Nations, as well as those of other civilizations, especially the Dwarves, are protected against both magical and physical attacks through enchantment. The military also requires considerable supplies of magical equipment and tools, and keeps artificers on hand to provide such equipment. Ever since Elvenkind settled and cultivated the land, agriculture has been a cornerstone of our civilization, and with it a vast array of magic has been created to help encourage it and free those of our kind to develop our civilization. While some amount of personal effort is still required, magic improves the efforts of those involved. The main effect of magic on agriculture is to encourage growth of crops, providing better yields and more nutritious results. The environment also has a heavy effect on agriculture, and in normal times magic is used to adapt the crops toward the year's rainfall and weather patterns. While such measures are ineffective in times of severe drought, heavy flooding, or magical instability, common years see much benefit from their use. These improvements result in the output of our fields exceeding our need by a fair margin. Magic also helps us preserve the excess, giving us a reserve of food that would supply the Nations for many years. In contrast to most of the industries mentioned, agriculture and the military are two where magical support is the rule rather than the exception. The ruler of each Nation retains a body of mages whose role is to support these industries, and who are paid quite well for their efforts. Clockwork is one of the few modern technologies that is almost exclusively utilized without the help of magic. Part of this is due to the influence and expertise of the Gnomes, who are the best suited of the civilized races to the task, due to their small hands and nimble fingers. While its mention would appear to be out of place in this document, this lack of magic is notable both for its resistance to the trend of magical influence and the common misconceptions about its nature. The Gnomish advances in clockwork are quite impressive, and are sometimes mistaken for magic when seen. Most often publicly seen in the form of toys, some of their gadgets may spout fire, emit steam, move about, or produce noises. Despite their outward appearance, it is important to recognize that most of these trinkets are simply mechanical in nature, despite what some would claim, though there is the rare Gnome who does imbue his gadgets with magical properties. This is quite the contrast to the downplay and ignorance of magical influence in common trades. Clearly, magic is present in nearly all aspects of modern life, but its perceived influence is often quite different from reality. The perceptive scholar should recognize the influence of magic, both in the course of his daily life and in his studies in history, and be prepared for the future evolution in magical uses. This page was last modified on 28 April 2017, at 13:57.